Baby Harper arrived on March 17, and she is absolutely perfect! I couldn’t get over how alert she was. She was awake the whole time I took her photos. Only to fall asleep as soon as we were done. She has a lot to be curious about though… being welcomed home by four siblings and her proud parents, Cory and Ashley. Welcome to the world, Harper! Photo Whimsy by Megan is a Clifton, Illinois-based photographer. Can I just say how I excited I am for these two!! I have photographed their family for a little while now. I was excited to capture their engagement photos and am looking forward to their May wedding. Then, I found out the exciting news that they were expecting!! I was so honored to be a part of this moment as well! Harper Louise is expected to arrive in March. We can’t wait to meet her! Blake and Kaylee have been married for two years. It was an honor and a surprise to have been contacted by Kaylee, as she lived in California at the time. When she said she was interested in a session in Gilman, I was intrigued. Kaylee lived in Gilman for much of her life, and she was to be in town again for her sister’s wedding. While in town, she wanted to take advantage of having photos done. This was the first time they’ve gotten photos taken since their wedding. We met in Haun Park in Gilman. This was a new place for me, and I’m quite excited about this hidden gem! It is a relatively hidden park and pretty spot. I enjoyed our session and am happy to have been able to meet with this lovely couple. Zack and Jessica are expecting their first child. Their baby girl is due in July, and they are so excited for her arrival! For their session, we met at Governor Small Park in Kankakee on a warm (okay, pretty hot) summer day. It was awesome to see these two again! I photographed their engagement session and wedding, so it was an honor to have them call me about a maternity shoot as well! These two are as sweet as can be, and I wish them all the best! They are so close to meeting their baby girl! Bring on July! The Christmas season is upon us, and I was so excited to take this family’s photos. I met them in their beautiful home for a classic setting. I just love their fireplace, and they really do have the perfect house for photos. Luckily for us, we met up while it was still somewhat warm outside! That winter chill hadn’t hit quite yet. Wishing you and yours a very Merry Christmas season! I’ll see you all next year! Photo Whimsy by Megan is a Clifton, Illinois based photographer. Thanksgiving is a time for family and friends. A time to give thanks, express gratitude. It is the kick-start to the winter holiday season that so many of us look forward to year after year. This year, I am thankful for so many things… my husband and dog, our families and friends, our jobs. This year was extra special because a co-worker volunteered to work my husband’s shift, so he could have the night off! I am also thankful for this family. 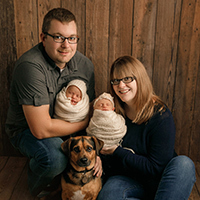 Jeff and Molly are an amazing couple and great parents (I think you can tell by Mav’s BIG smiles!). My husband and I stood by their sides when they got married, and they stood by ours when we got married. We are very happy and proud to be Maverick’s godparents. Family truly is one of the greatest GIFTS. We had a good time during our session. It is always great to get caught up, and we even went to dinner afterwards. I wish them an amazing holiday season. Not as cold as it could have been, I met up with Eric, Kristi and their three children for a mini session on a brisk, fall day. We had blankets galore to wrap up the kids in between shots to keep them warm, and they were loving that! Prior to our session, I messaged them to see if their littlest could sit up by himself… it seemed like he was born just a few months ago. And, I met up with them to realize that he was almost 1! So hard to believe! The kids were full of smiles, especially the littlest. We got some great shots of all of them. Continuing with my whirlwind of fall sessions, I met with the Kolosky family on a chilly Saturday. It was a pretty cold day, but you would never know by looking at these photos. The Kolosky family jumped out and ready to go. They are such a great family… lots of fun, lots of laughs. Their youngest brought lots of energy with him and kept his family on their toes throughout our time. We had a great session, and the fall colors were stunning! Nobody was shy this year. Haley brought along her little friend, Lamb-y to the session. Lamb-y stayed for a few photos but also came behind the camera with me! She even helped keep mom and dad company when it wasn’t their turn for photos. What I couldn’t get over is how proud the girls were of their outfits and accessories. They told me how they went shopping for shoes. The showed off their necklaces and bracelets. Their fingernails were painted. Emily was even wearing earrings and a ring… just like mom. They looked adorable. We had a great fall session, and our timing couldn’t have been more perfect. Seems like they’re always calling for rain when I schedule sessions, but this time, the rain held off until later in the day. And the colors were absolutely gorgeous! It’s amazing how quickly the leaves can change and start to fall. It was a picture perfect fall day complete with a light breeze. One thing I love about Illinois is the changing of the seasons! After a few months of summer heat, I’m ready for the crisp, cool air of fall. Not to mention, the changing colors of the landscape make for beautiful views each day. I met up with Ashley and Cory in Kankakee on a Sunday morning after an intense rainfall. Somehow, even though my yard at home had lots of standing water, we didn’t run into any issues with water and mud during our session! The kids jumped out ready to pose. I’ve said it before, but I’ll say it again, those kids are so well behaved. Each one of them cooperated and was easy-going. It didn’t even seem to bother them that it was a little chilly out. This was one of the first days where it truly felt like fall. I couldn’t be happier with how they turned out. Hi! I’m Megan. Wife, mom to twin girls and dog mom. I love watching movies and eating ice cream. I can’t wait to photograph you!